Yesterday, as the hours flew, I did all kinds of odd jobs for the book. Here is one thing I did: I tried to call Joan Fontaine, the actress. Her number was in Leonard Pennario's address book. Unfortunately her line was busy. Twice! Then it was time to go to church -- it was the feast of the Immaculate Conception -- so I had to run out the door. Don't worry. I will keep trying! 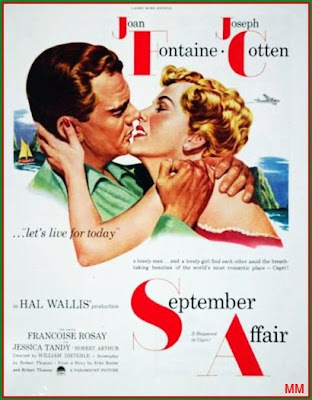 Joan Fontaine and Pennario worked together in the 1950 movie "September Affair." She played a concert pianist and it was Pennario's job to coach her and make it look as if she were really playing the piano. He had funny stories involving that. Once he escorted her to the Oscars. She was lucky, having Pennario as a date! Imagine that. Pennario played on the soundtrack of "September Affair." Click on the Pennario link up above and you'll hear him. I have run that link before but I never get sick of it. Besides trying to call Joan Fontaine I did other stuff. This is how putting a book together works. At least this is the only way I have figured out how to do it, with my nutty schedule. You do this, you do that, it all adds up. Brick by brick, as they say in Scripture. I called a couple of Pennario's friends whom I had met at the luncheon after his funeral. It embarrassed me that I had not called them before now although Howard tells me now that it has really not been that long. It is still less than six months since that surreal week at the end of June. Leonard's friend Chuck, one of the people I called, lives in Hawaii. He and his wife were especially nice to me, I remember that. Very warm. Yesterday he answered his phone he was in the middle of a meeting -- he is a real estate developer -- but we made an appointment to talk and then he told me: "I am so happy to hear from you. I am so glad you called." He is a very handsome man, I remember that. Blue eyes. And the other person I called yesterday, a woman named Dannine, is very beautiful. She and her husband met Pennario at the beach club in Beverly Hills. I remember her telling me he was just lying around the sauna and they made friends and it was some time before they even realized he was a concert pianist. That is how wonderful Pennario was. I will not say he had no ego, because he knew what he was. But he did not shove it in your face. 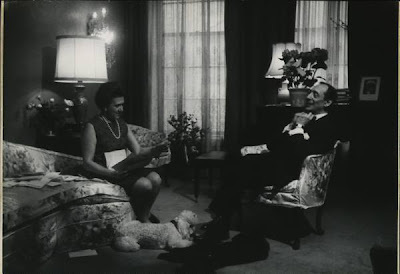 Imagine meeting Vladimir Horowitz in the sauna. I know, No. 1 you would not want to meet him in the sauna and No. 2 he would not be there anyway. Horowitz was too boring to go anywhere near a sauna. But imagine meeting him there, just for argument's sake. He would let you know who he was right away! Notice Joan Fontaine never asked Horowitz to go with her to the Oscars. Here is Horowitz's idea of a good time. When Pennario was 17 he went and played for Horowitz. I bet he was in that very room. I used to love it when Pennario talked about that. He would get me laughing so hard. Where was I? Leonard's friend Dannine. After the funeral I sat with her and her husband at the luncheon. They invited me to. I will never forget that day. I couldn't eat anything because my bracees were giving me problems and also because I was too overwhelmed by seeing these people whom I had heard about from Leonard, and who were in his diaries. This is Dannine, I was thinking. He used to go to her house on Christmas Eve. That is how close they were. She was crying. I felt so bad for her and I was trying to figure out what to say to console her. There are just no words at a time like that. I was thinking what a flip my life had done. One day I am at my desk at The Buffalo News, calling this man, this pianist, I had hardly heard of. And then it was as if something picked me up and put me in this different world. Writing a book about someone, I am telling you, it is a strange experience. You know the quote about better to have loved and lost than never to have loved? Well, it strikes me that you miss Leonard and are sad when you talk to these people, yet you are so happy that you knew him and that you're meeting people who were part of his life. It's all very poignant -- and life-changing, in so many ways. I'm sorry to ramble. I hope I conveyed this adequately because I think the whole thing is really pretty wonderful.